The first time in awhile I could come and post–school has eaten me alive, but I finished my program and am gonna start job hunting soon. Meanwhile, I’ve been slowly building a daily ritual of offerings and prayer towards the Canaanite pantheon. I’m conscientious about my path at the moment. I’ve been exploring different spiritualities and religions for years, ever since going to college. In the last 5 years, I’ve always come back to Catholicism. As cool it would be to worship the deities of the Philippines, where my family comes from, I have a hard time associating the Philippines (and my family) with anything but Catholicism. So it kind of scares me when I realized that I am going further into studying and honoring the Canaanite pantheon. For all my bouncing in and out of Catholicism, I have felt a response to my calls to the Gracious Deities: Athiratu, Anatu, Choranu, so far. I am drawn to Them, the way I used to be drawn to the Virgin Mary. My connection isn’t that clear with them yet, but the glimpses I get during prayer or simply meditating upon Them have shown me that They are very present. Anatu is a goddess of action (and Her myth and associations scare the heck out of me); Choranu is quiet and steadfast; Athiratu has helped me with Her wisdom and sheer presence to help me find a stable center. I’ll probably find out more, as soon as I get over myself and reach out. I am a master of worrying myself out of actually doing anything. Lilinah’s website Qadash Kinahnu, a very informative site that brings a second perspective to the books above. Categories: Pagan Blog Project | Tags: Anatu, Canaanite, June, M, Pagan Blog Project, pagan groups, reflections | Permalink. I’m what some people would call a Christopagan. I’m Christian in that I was raised in the Roman Catholic faith, from birth. My parents come from the heavily Roman Catholicized Philippines, so it was no question that I would be raised as a Roman Catholic. My K-8 and high school education was in private Catholic schools, paid with saved tuition and volunteer hours at the church. In fact, I live nearby my same church now, and drop by when I want to say hello to the Blessed Mother. But I’m not strictly Catholic anymore. I look at the natural and elemental world, and I see that there are more powers in the world than what Christianity speaks of. And contrary to the somewhat benign condescension of the Vatican toward other religions, I believe that other religions in fact have as much faith and power in them as Christianity does. (When we discussed it in school…and that’s IF we discussed it at all, other religions were simply “not as full of grace” as Roman Catholicism.) If anything, seeing the world as immanent, full of power, has given me more reason to be a more conscious person/Christian/Christopagan/Pagan, than when creation was passive, and full of sin, in the Christian point of view. Yet where does a lapsed Catholic go when she is exploring the other faiths? I’m darned lucky that I have been coming of age in the Internet era. There’s more information available now than even 10 years ago, and I only found as much as I did because I was in college. I look at my Roman Catholicism as my “spiritual native language”. I grew up calling God as Father, and Jesus as the Son of God. With the Holy Spirit being…somewhere in there. And Mary is the Divine Feminine of Christianity. The Archangels have also been a constant presence, especially when I had my dark days back in 2008. So, where am I learning my ‘new language’ now? Youtube, of course. I’ve browsed forums on paganism, Wicca, and other witchcraft-friendly forums. There’s something immediate and real when hearing someone talking about their spiritual practices, the ups and downs, and the lessons they learned from it. What is so pagan about my spirituality, if my first spiritual learning was in Catholicism? Giving thanks to the guardians of my home, for instance. Today I offered a shot of beer that I had bought with my dad. (I am in the broom-closet still, alas.) I look at it and I see the time I got to spend with my dad shopping, going through the day together on a Saturday afternoon. 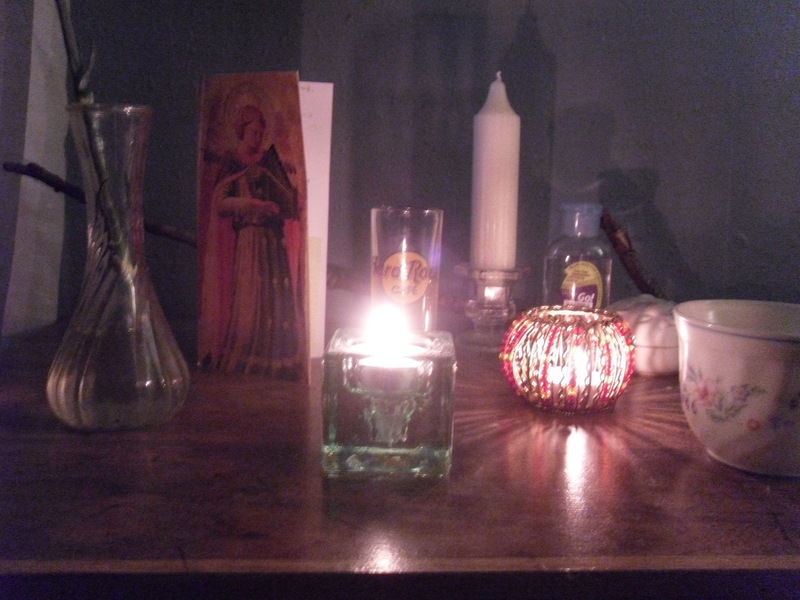 I wanted to say thanks–and the offering (with a lit tealight candle) is a tangible way to represent my gratitude. Would I need to do it, if I was using a strictly Christian framework? Probably not. These thoughts may not hew strictly to the Pagan Blog Project, but it gets things off my chest. Categories: Uncategorized | Tags: altar, Anatu, Canaanite, Christopagan, March, pagan, pictures, Roman Catholic, spirituality | Permalink.